Every time I read a blog post or a tutorial about HSTs (half-square triangles), I see someone calling them "yummy" or "pretty" or "beautiful," so I thought I would add in my own description. Don't you just want to eat them all up? 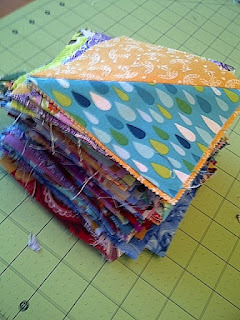 This is my preparation to join in the Warm Cool Quilt Along over at In Colored Order, which is almost done. I'm planning for this to be my donation to 100 Quilts for Kids. Thise HST really are looking scrumptious! 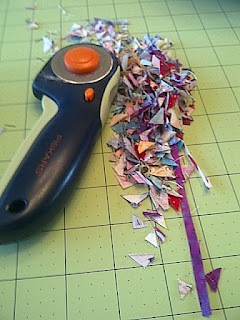 As for those scraps, well you could lay out some bondaweb or mistyfuse something like that, scatter the scraps on top if you then add a layer of netting on top of that and freemachine all over it you could make yourself a nice pice of confetti fabric. That is a great scappy quilt. As for the leftovers, you could put then in a decorative jar and sit them on a shelf.